Attended my daughter’s grad from McGill and needed a roomy space for 4 adults. Our suite 304 had two comfortable king beds and the most amazing shower. Full kitchen incl Nespresso and Magic Bullet, tons of space to hang clothes for 4 people for 3 days. Got lots of use out of the two umbrellas provided. Improvements to consider: provide a corkscrew and clothes washing soap, wifi was not that strong. Overall my family enjoyed staying there. We had reserved 2 lofts at Milton Parc. There were 7 of us, and we had a wonderful time. The lofts are clean, and are equipped with everything you could want -- plenty of fresh towels, silverware, plates and glasses. The beds are comfortable and the bathrooms are large. I would stay here again in a heart beat! As the title suggests, the room was very big. Much bigger than I expected, which was a plus. It was also clean and well organized, and gave more of a loft feeling than a regular hotel room. It would suit more as a partying room with such spaciousness i guess? Now the cons. This place has no lobby. The appearance of the hotel's building doesn't seem anything like it. No signs, logos, whatsoever. And no early check-in or baggage service is possible so if you are arriving early, MAKE NOTE OF IT!! Oh and our room had no tubs when I thought I was getting one. Annnd finally the construction. Is the hotel going through a renovation or something even when the visitors are there? Other than that, the overall experience was good enough. Great location with walkable distance to most of Montreal's desired places. Cacao 70 is right below so you can grab your brunch there. Stayed at Milton Parc, Montreal for the second time this year, once in February and just recently in November 2018 with my Mom for 2 nights. I've stayed during off season dates which kept my travel cost down but allows for a luxurious way to take advantage of really cool accommodations. 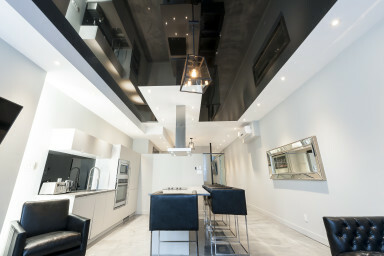 What I love most about the units are the kitchen amenities, large bathroom with 2 sinks, and if you are lucky enough have access to the upper level bedroom with a walk out to the roof top patio with a view of the cross atop Mont Royale and finally the location close walk and proximity to everything. I usually buy groceries from the local market which is a 2 minute walk away and then enjoy cooking up a storm while drinking wine. Love this place and am planning a family vacation next year with the hopes to book at least 3 units on the top floor. I absolutely recommend staying a Milton Parc, the Simmplissimo team make it easy and a secure way access the unit without a concierge desk, and ask questions anytime you need to speak to someone. They quickly respond.